(Admit it, that song is in your head now, isn't it?? If you don't know that so g, get it! The Mammas n Pappas did this song well!). 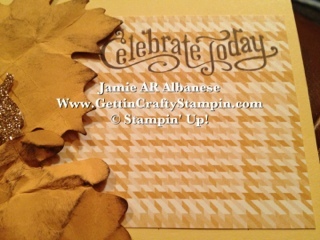 My fun Fall tastic class was a blast! 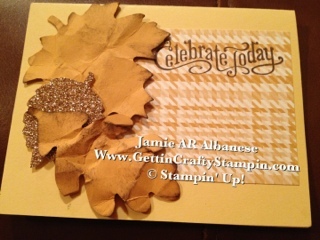 Here is a fun card that started off clean with tons of "White (So Saffron) Space" for the LNS challenge this past week. Starting with the Autumn Accents Bigz Die, the Big Shot, Champagne Glimmer Paper, Howlstooth & Scaringbone DSP, So Saffron cardstock for the card base, Perfectly Penned sentiment stamp set and Chocolate Chip ink. You can see the two different cards here. 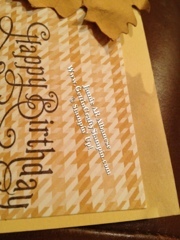 The 'Celebrate Today' card is my original "clean" card. 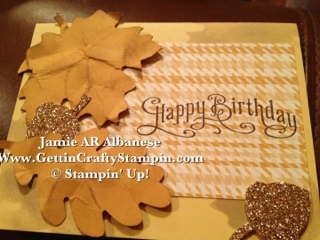 I punched out the leaves in More Mustard paper with the Autumn Accents Bigz die and Big Shot. Crumple the leaves then rub the creases with a sponge dipped in the Chocolate Chip ink. The edges and the crumples looks amazing! 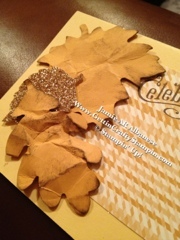 Punch out acorn or smaller leaf with the same die and the Champagne Glimmer paper. 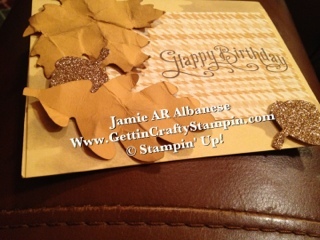 Layer and adhere with Stampin' Dimensional adhesive. 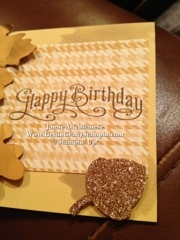 I used only one or two Dimensionals so the the realistic flow and movement of the leaves added to this cards Fall feel! The DSP is in More Mustard and So Saffron is the monochromatic sister to it. Stamping the Chocolate Chip inked and placing it on the DSP. The Perfectly Penned greeting stamp set is so curly n lovely. On the Happy Birthday card I showed my class how to use the cardstock that was left behind, the sponge and created additional depth and interest with a stenciled shadowed leaf on the page. I like how the two acorns look here, layered and one looks like it rolled away. The shadowed leaf under it justs adds a little interest. You can see here how the Celebrate Today is loaded with "White Space" in So Saffron. I like how adding the shadows changes up the card, too! Thanks for looking! Tell someone about it!! Comments are sooo appreciated! Have a Fall-Tastic day!